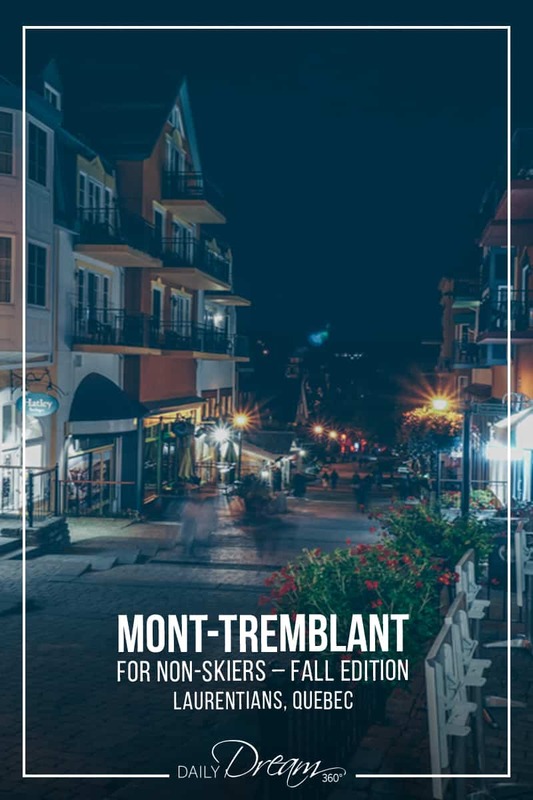 I’ve always thought Mont-Tremblant was just for skiers. It didn’t even dawn on me to go there because I don’t ski and I don’t climb mountains. I figured it was one of those places that extreme sports people would visit. Was I ever wrong! 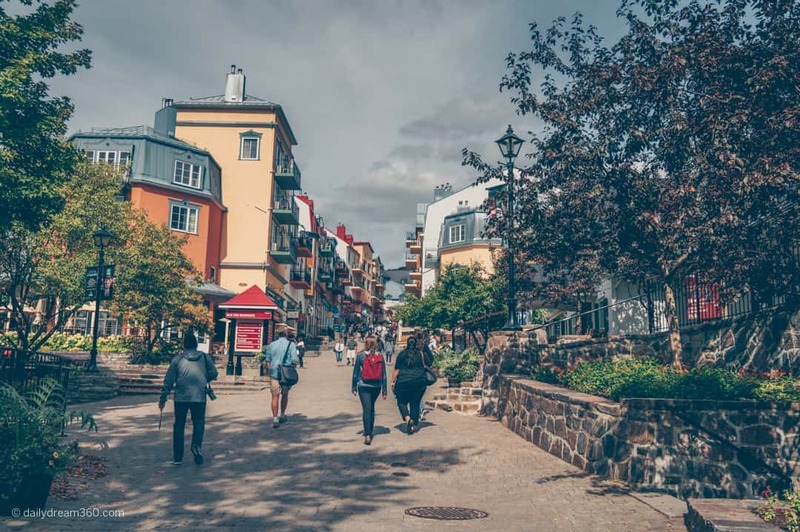 There is so much to do and see in Mont-Tremblant Village and it’s a year-round destination. I had the opportunity to explore it for the first time during the fall, and I can’t wait to go back again. 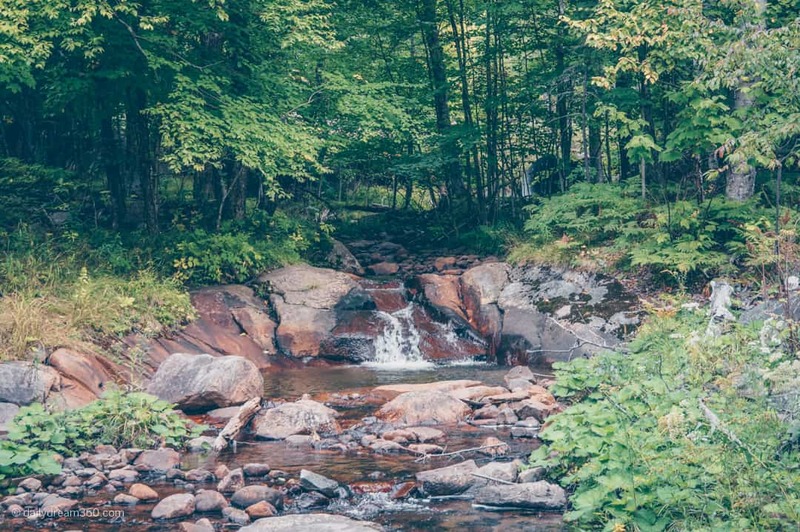 Of course, the changing of the leaves is a highlight for autumn visits to the Laurentians region in Quebec. My stay was a little early for fall colours. However, I still found plenty to see and do on my trip. 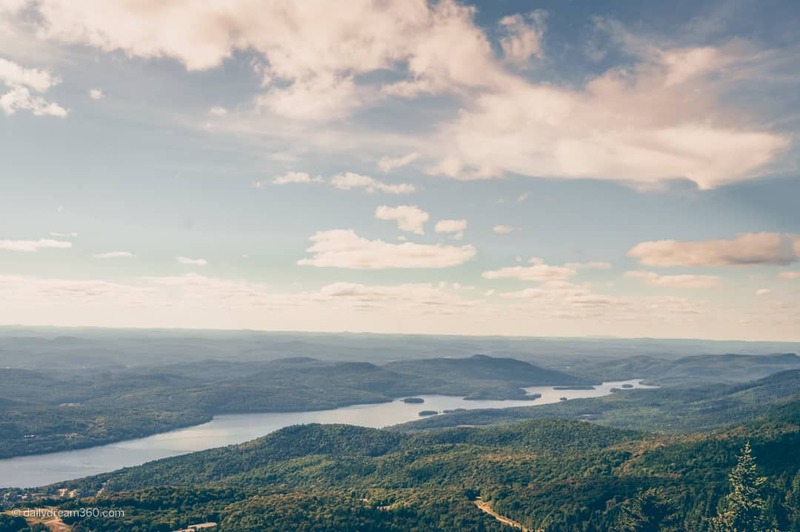 You don’t have to be a mountain hiker to enjoy the breathtaking views from the top of Mont-Tremblant. There are some spots where you can get some great shots as soon as you get off the gondola. 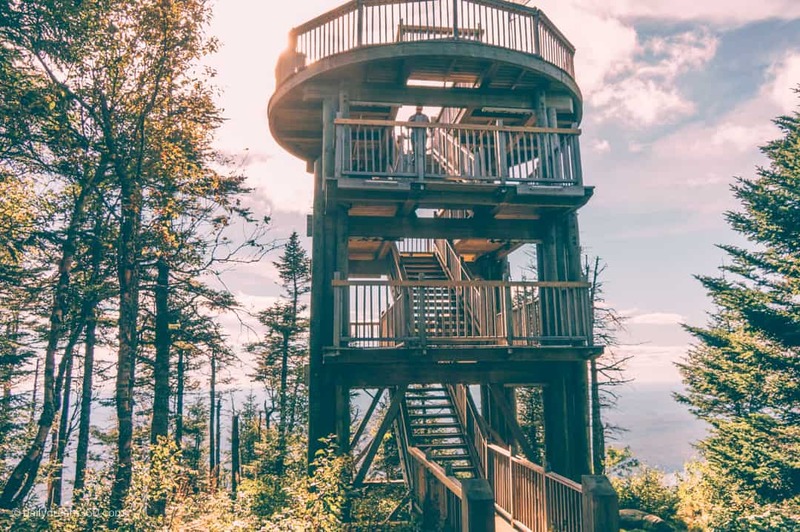 I do recommend the very short walk over to the observation tower for a 360-degree view of the mountain top. 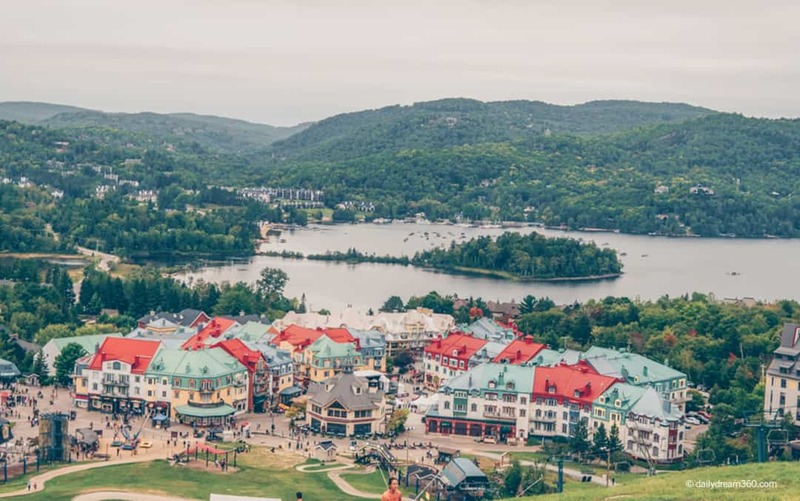 One thing I realized quickly is that the view from the bottom and the view from the top was only a glimpse of how large Mont-Tremblant is. There are some trails on the mountain and in the village. Some are more adventurous than others. However, there are more than enough trails for even the mild hiker like me. 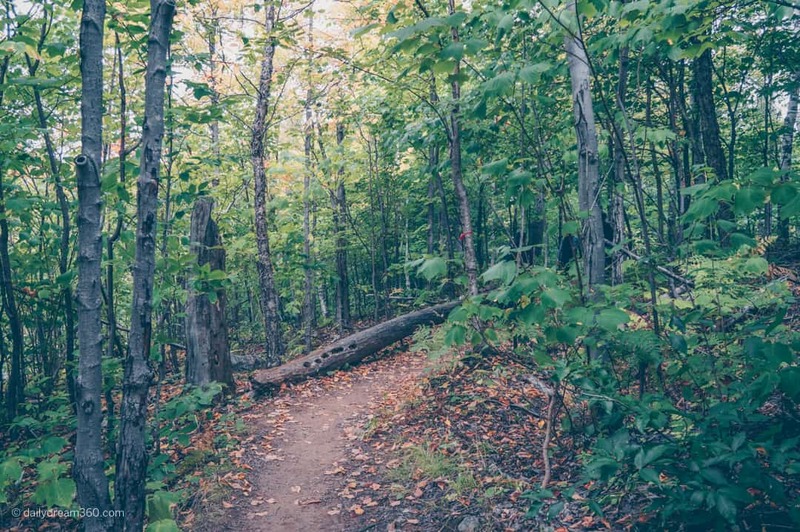 With good hiking shoes or cross trainers, you will be able to navigate these dirt trails easily. 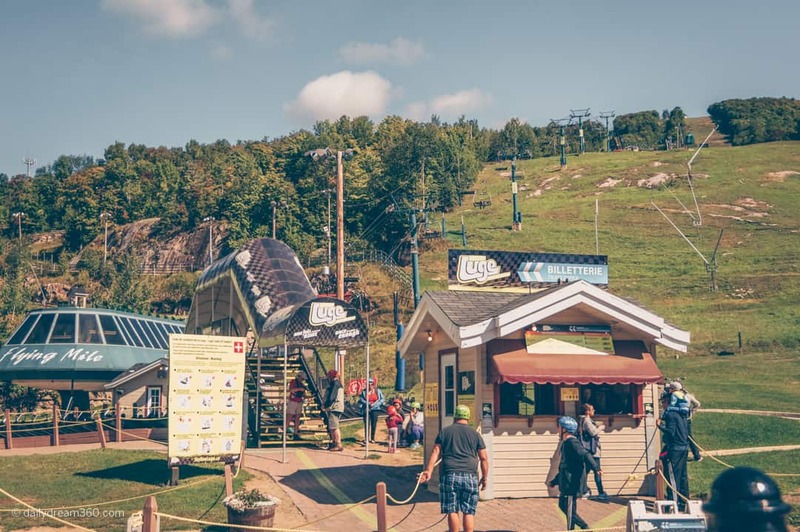 This trail taken from the base of the mountain from Mont-Tremblant Village was part of our Tremblant Gourmand food hike. It had challenging stairs and other steep slopes at the start but eventually meandered into a beautiful and scenic trail. The trails at the base of the mountain were also great for spotting deer. If you happen to take your walks very early in the morning, chances are you will bump into a deer while walking the trails. 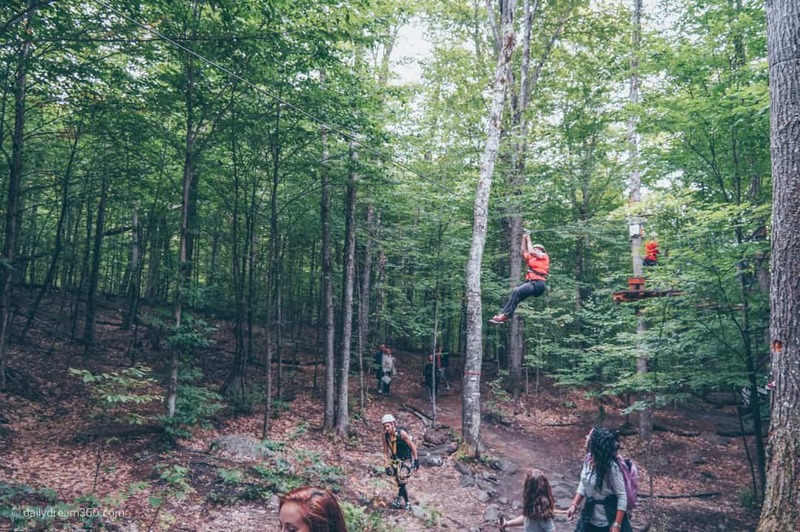 There are three zip line and treetop trekking courses for adults. They include some ladder bridges and other obstacles with intermittent zip-lines throughout. The first two courses are more relaxed, gradually increasing in difficulty to the final sequence. The last part is considered advanced so might not be for the soft adventure traveller. There is also a children’s course available. 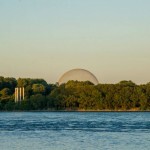 Now, this is an attraction that everyone will love. Even children were navigating their way down the track of the Luge ride. 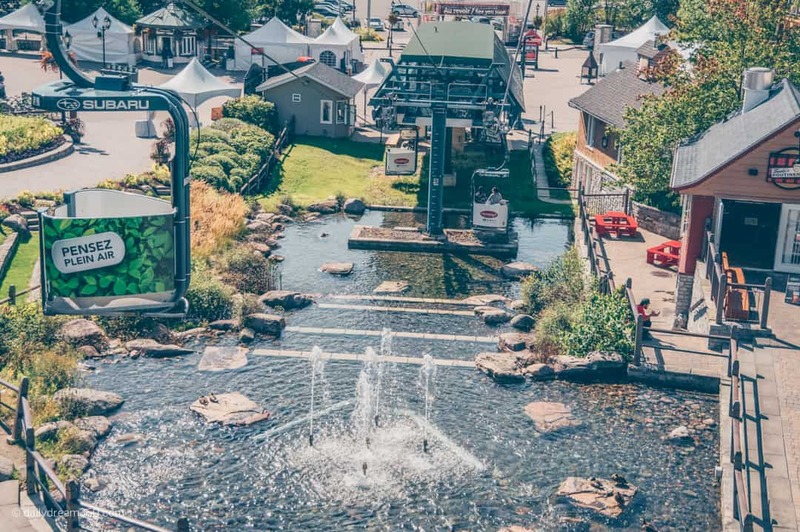 One thing to note, in the fall the luge ride has limited hours. On our first day (which of course was the blue sky day) we arrived in the afternoon to find that it was closing down. On the second day at the mountain, we made a point to start at the Luge. 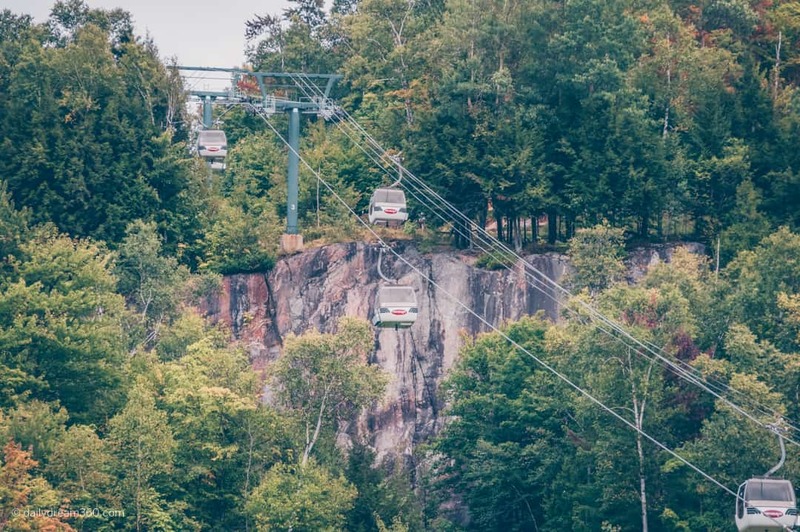 The ski lift was modified to carry us and the empty luge carts up to the first summit on Mont-Tremblant. 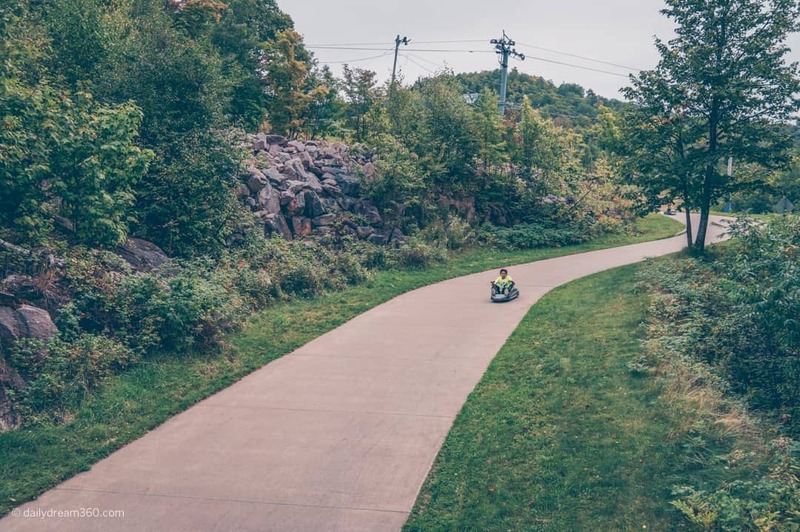 There we received some quick training on the luge vehicle, and before I knew it, I was zipping down the mountain. This is a fun ride for the whole family. Don’t bring a lot of gear up with you. I had a backpack, but there is nowhere to store your stuff in the cart. Dress for the weather; you are in the mountains after all. Listen to the instructors on how to stop, slow and turn the cart; there are a lot of turns on the course. Obey the slow down signs along the course to avoid tipping your cart. Have fun; the ride down goes by quickly. Ok, so this is not a ride but a free people mover that runs from the bottom of the Village up to the higher part of it. 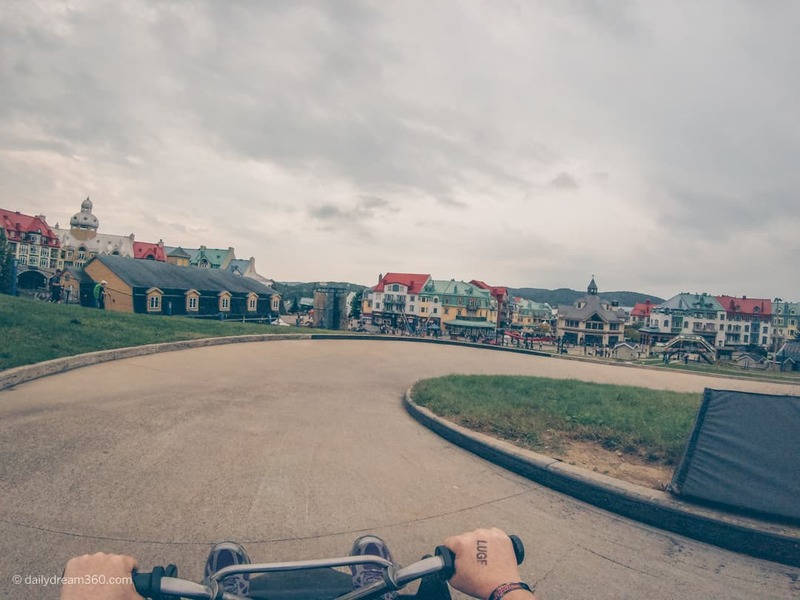 There is a steep walkway to get through the village and the Cabriolet lets you avoid that steep hill. The little gondolas offered a breathtaking view of the village and a break from walking up and down the steep hill to the lower part of the village. 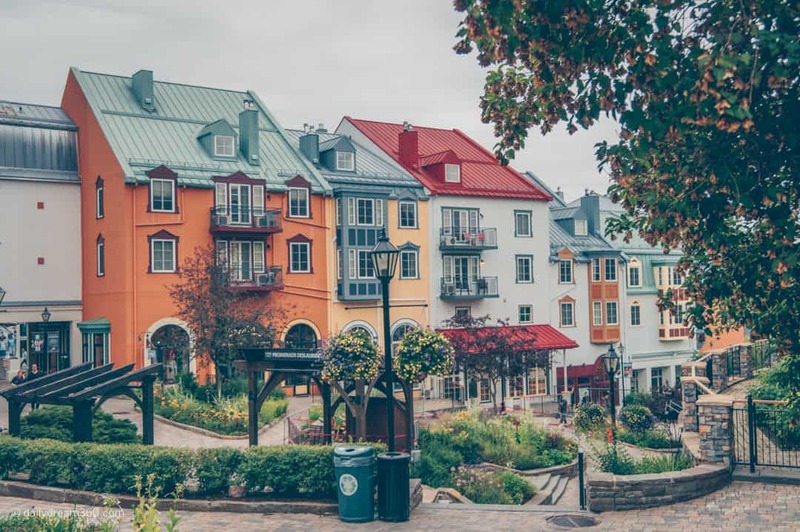 Of course, Mont-Tremblant village has many stores throughout its colourful buildings. These stores start at the bottom of the village and line the walking paths up the hill to the upper part. 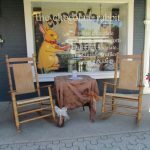 From clothing, souvenirs, jewellery, local food specialties and sporting goods, there is something for every shopper here. 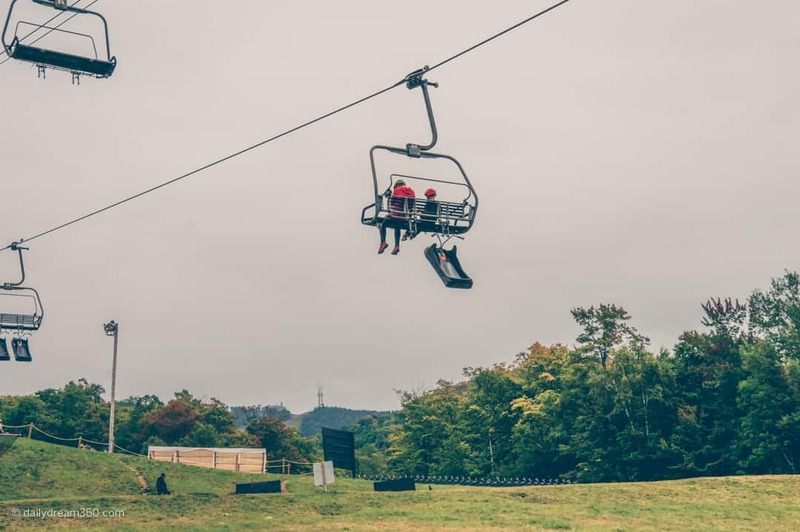 Of course, you can still shop for ski season during the fall months. 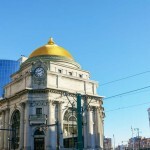 There is no shortage of cafes and restaurants in the village. This restaurant featured an Asian Thai fusion menu. 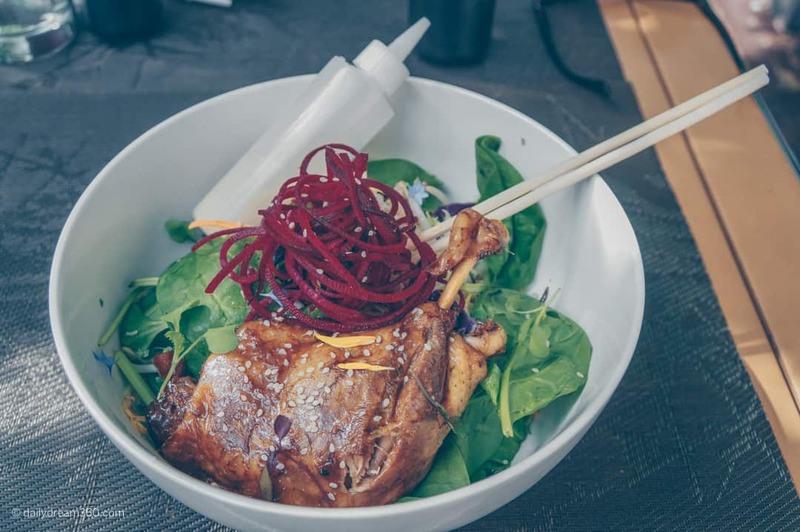 There were some delicious items on their menu, from dumplings, spring rolls and fried calamari as appetizers to the delicious Duck Salad I had above, we had a great lunch at Wok. Other favourites from our group were the Pad Thai and Curry Bowls. 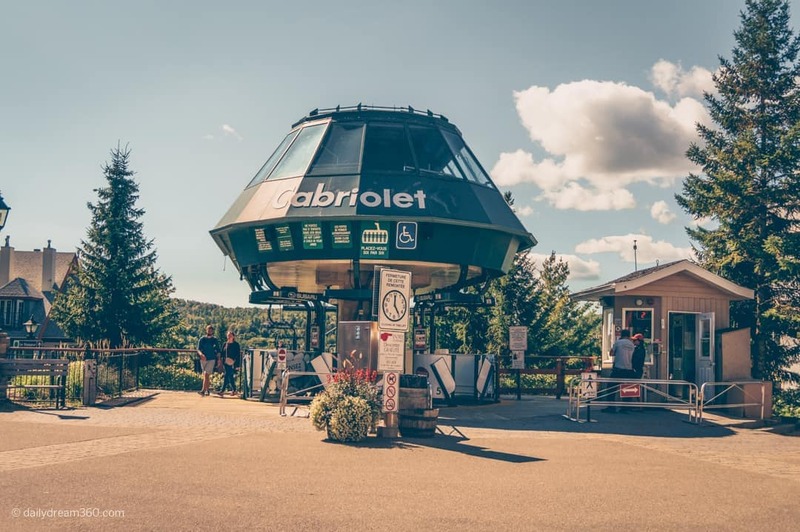 With another chance at climbing the mountain in a Gondola, Casino Tremblant is secretly waiting to show you the view from their side of the mountain. 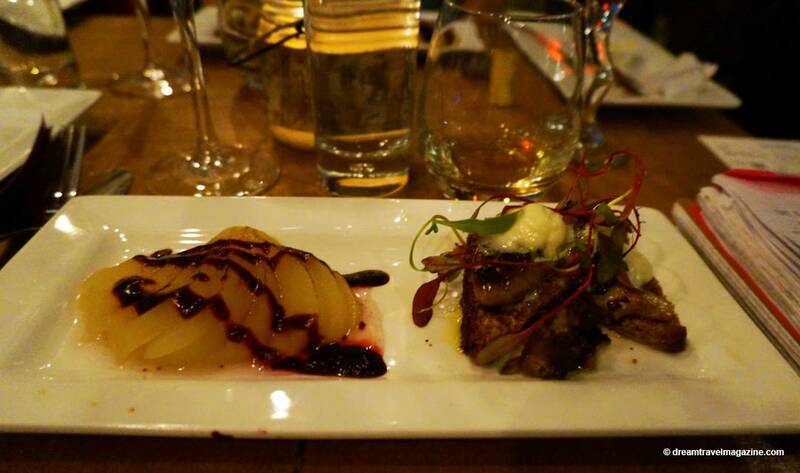 Even if you are not a gambler, the ride up to enjoy a great meal at the Altitude restaurant was a highlight. 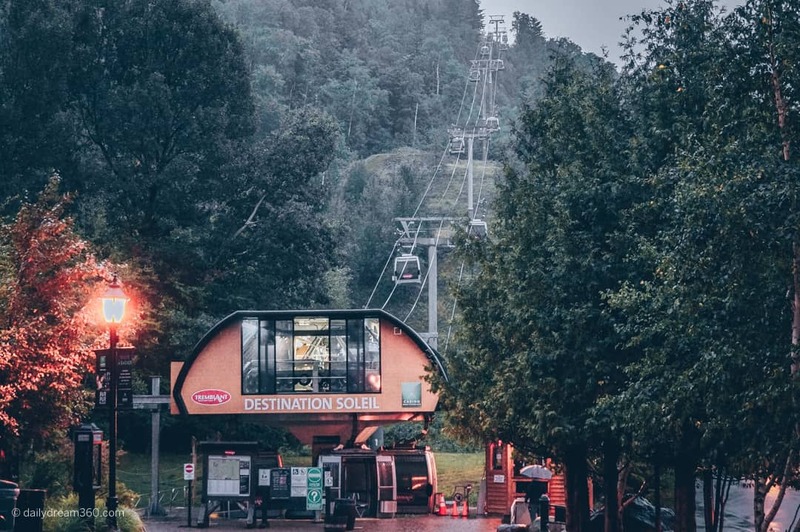 Unfortunately for me, it was rainy and dark by the time we got in our gondola, so I didn’t get those dream shots from the sky. The Casino Gondola stopped running at 10 PM on the weekend but, we were able to take a quick ride down the mountain on a shuttle bus that dropped us off steps from our hotel. 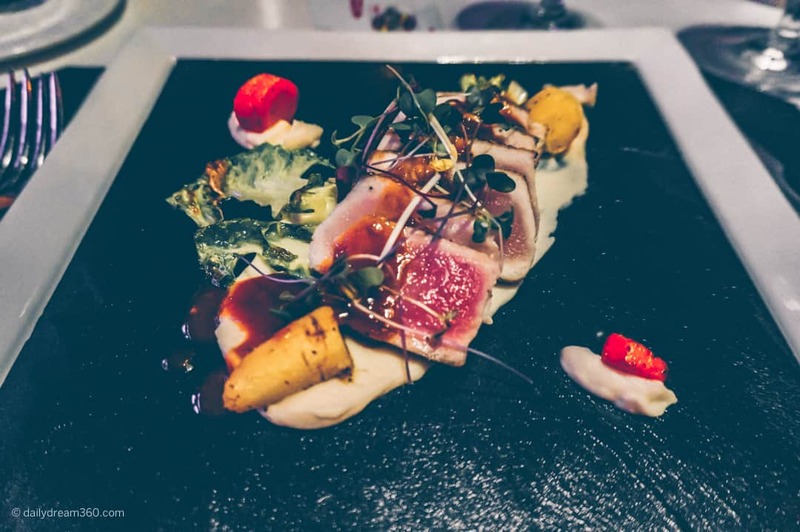 I had one of those foodie experiences at Laurent Louis that deserves its post so which I will be sharing soon. Let me assure you as far as French bistros are concerned this restaurant will not disappoint. 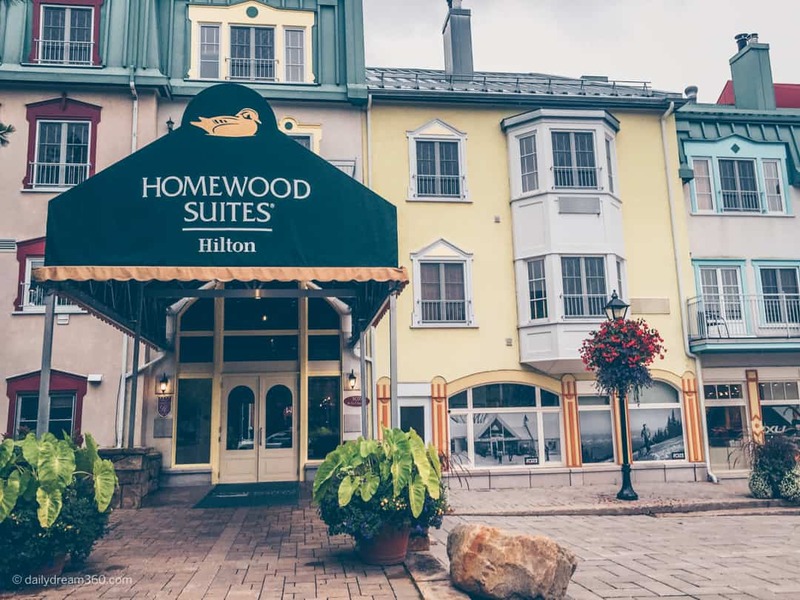 I stayed at the Homewood Suites by Hilton located in the upper part of Mont-Tremblant Village. 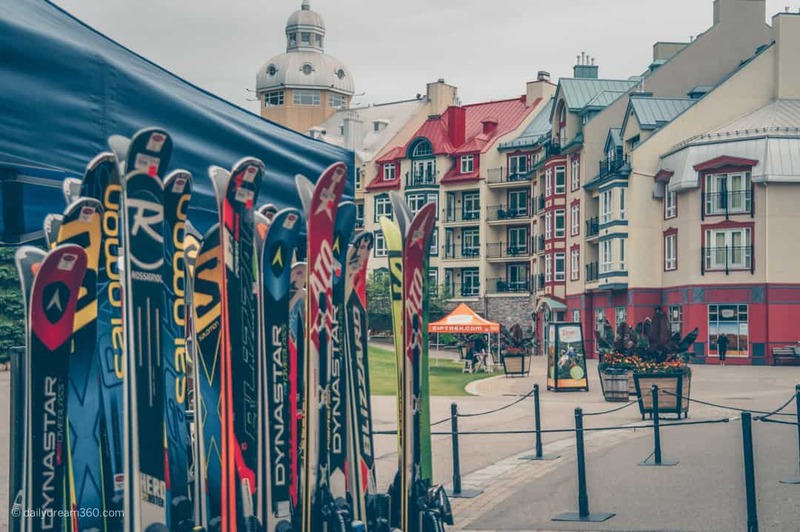 The hotel had rear access right into the village shopping area and was steps from the ski hill lifts and gondola. I found it was the perfect location right next to the Fairmont. I love these suite hotels because they offer you the opportunity to cook a few meals right in your hotel room. With a full kitchen, living room suite with fireplace and separate bedroom and bathroom, there was lots of space for an extended day. 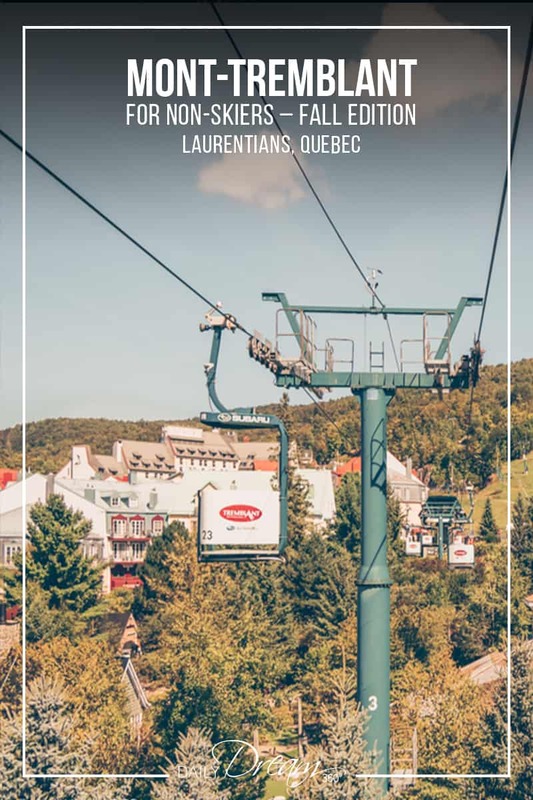 Travel assistance provided by the tourism boards of The Laurentians and Mont-Tremblant. As always, the opinions expressed in this post are my own.